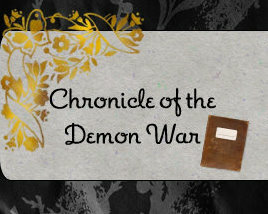 Here is where I will be posting updates about my Demon War Series! When I had my novel up on Authonomy here is what some people said about it. Your vivid imagination coupled with your highly descriptive writing style makes your finely crafted fantasy a pleasure to read. Your work is well paced and well written. Your use of imagery is excellent and the dialogue is tight. Backed with pleasure. My kind of book! You’ve created an intriguing new world that us readers want to dive right into. Oein is a great character and one that we will follow to the end, hoping she can overcome her past and grow. Very well written, with lots of creativity. Backed with pleasure. The opening set up the book so well and then in to the second and it all starts!!! I think the style of writing for this is superb and complaints the book so much. Very imaginative. I enjoyed this. Great premise, atmosphere, details. Yes, a bit of editing – it’s what we do. Happy to back, though – I think you will have a great tale that will be a serious asset to the genre and appeal to a wide target audience. An amazing fantasy, set in a believable world! I think you’ve done a wonderful job with this, it’s exciting, there are some great characters, and it make the reader want to keep going! I read the whole thing and liked it. Sure there are some editing issues but I’ll leave those to someone more qualified! I like to tuck in and just enjoy. You’ve got a wonderful imagination! Wow, what a pitch. It sucked me straight into the story, and I have to say I was pleased with what I found. This is an excellent premise, and you characters are strong and well constructed. There was the occasional grammatical error, but they were eclipsed by the fast-paced plot.